For the Sega Mega Drive game, see Shadowrun (Mega Drive). 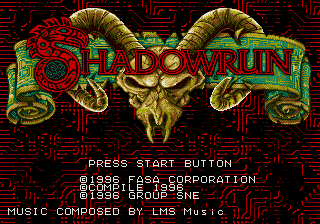 The Sega Mega-CD version of Shadowrun (シャドウラン) is a 1996 RPG by Compile based on Group SNE's adaption of FASA's tabletop role playing game, Shadowrun. Despite Shadowrun being an American invention, this video game interpretation was not released outside Japan, and aside from sharing source material, is entirely different to the Sega Mega Drive game of the same name. Shadowrun was the last game to be released for the Mega-CD in Japan, debuting in early 1996 (though Sega's master list incorrectly lists the game as being from 1995). Main article: Shadowrun (Mega-CD)/Magazine articles.